The building located on the north side at 61 Holland St. West was built in the Romanesque Revival style around the 1880’s. The Scanlon Law Offices building was originally constructed to house the law practice of the two Scanlon brothers. 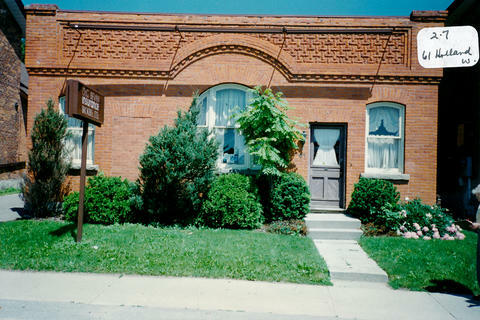 Albert "Ab" Scanlon, a lawyer, and Mrs. Frank (Ethel) Woods, a widow and retired farmer (from the 8th Line) both resided here at one time. D.G. Bevan Insurance Brokers, Ltd.
Business » D.G. Bevan Insurance Ltd.